The Rocket silo is currently the only win condition. Once the silo has been built and placed it can be filled with low density structures, rocket fuel, and rocket control units, which will allow rocket parts to be created within the silo. In order to launch a rocket, 100 rocket parts need to be crafted. Each rocket part requires 10 low density structures, 10 rocket fuel, and 10 rocket control units. When all rocket parts have been completed, the rocket silo interface is at 100% and allows the player to input an item as cargo. Launching the rocket empty or with any payload will complete the game, displaying a victory screen. The screen shows all kills and time played, and offers the player a choice of exiting the current game, continuing play, or viewing the replay. Launching the rocket with a satellite as cargo produces 1000 Space science packs, which are generated inside the silo. The silo interface includes the option to "Auto-launch with cargo", which will immediately, automatically launch the rocket if it is completed and cargo has been inserted as payload. Building a silo requires, among other things, electric engine units, engine units, and processing units, which must be produced in assembling machines and cannot be crafted by hand from raw materials. The rocket itself can also only be produced in the silo. The rocket silo accepts productivity modules, and due to the high resource requirements to craft a rocket is a good candidate for their use. The rocket silo result inventory can hold up to 2000 space science packs (one stack), the equivalent of 2 full rocket launch results. When receiving science packs from a launched satellite, the game discards (destroys) all space science packs that exceed the capacity of the rocket result inventory. The "Auto launch with cargo" checkbox does not check if the rocket result inventory can hold the expected space science packs, this has to be manually ensured by the player, for example through the circuit network. The duration of the rocket launch animation is 2475 game-ticks, or 41.25 seconds. This is the time from when the rocket is finished to when production on the next rocket can start, but does not include the time to insert the payload. Unlike rocket part crafting, the animation's duration is not affected by any modules or beacons. This may become a factor if one is planning to launch rockets at high frequency. For example, to launch one rocket per minute using a single rocket silo, one would need to produce the rocket parts within (60 - 41.25 =) 18.75 seconds. However, the shortest crafting time achievable for 100 rocket parts in a single silo is ~20.6 seconds; i.e., slightly longer than what would be required to launch 1 rocket / minute. This crafting time is achieved using the maximum of 20 beacons with all speed modules 3, plus 4 productivity modules 3 in the silo itself. The latter not only cuts resource requirements by almost 30%, but is also faster than using more speed modules 3 in the silo. Thus, the largest space science pack output one can obtain out of a single rocket silo is about (1000 * 60 / 61.85 =~) 970 per minute. Send a raw fish into space via rocket. Vehicles : When a vehicle is inserted into the payload slot, the player can enter the rocket like they would any other vehicle, then launch and ride it. This allows a fast-moving view of one's base (as the game world is internally 2-dimensional, the rocket actually simply moves north along the map), and then returns the player next to the launching silo once the launch animation has finished. 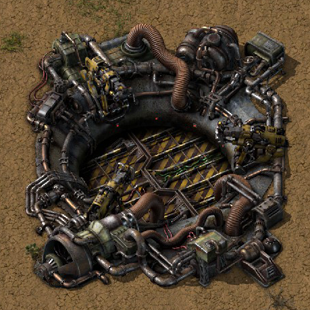 If all space near the rocket silo is occupied, the player is placed at spawn instead. Raw fish: Grants the "So long and thanks for all the fish!" achievement. Other than this, it also wastes the launch. Updated sprite and changed dimensions from 9×10 to 9×9. A satellite is no longer required to win the game. Rocket parts from building rockets in the silo now show in production statistics. Rocket silo now behaves correctly when out of electricity. This page was last edited on 8 March 2019, at 23:12.